Did you know that “genie” is an anglicized form of “jinn,” an ancient folklore character? In some beliefs and stories, jinns are similar creations to angels, and well, we can’t think of a better costume for your little angel than that. Instead of reusing those white wings and that halo from last year, why not try this sequined bolero jacket and headpiece with attached veil? Here’s another fun fact about jinns: in some stories, they actively eat or consume people’s dreams. Doesn’t that sound just like the first few years of your little one’s life? You didn’t dream once! Let’s face it, you were lucky if you got any shut-eye at all. Remember all of those nights where you swapped a trip to dreamland to rock her when she had colic, or when she was simply unwilling to sleep? Now that she’s a little older, she doesn’t steal your dreams quite so often, but she still influences your decision making. She asks for things in the sweetest way and does the cutest dances across the living room. She looks at you with those big eyes when she wants another cookie, or cup of soda, or her own tablet, and you just can’t say no. Like we said, she’s always been the perfect little genie. Therefore, she’s bound to be the happiest and most comfortable little trick-or-treater in this Child Dreamy Genie Costume. She can make her way out of her tiny little bottle and grant you and your family a few wishes; just be careful how you word your requests, you certainly don’t want any classic wish-granting mixups (you don’t want to truly be “made” of money, do you?). 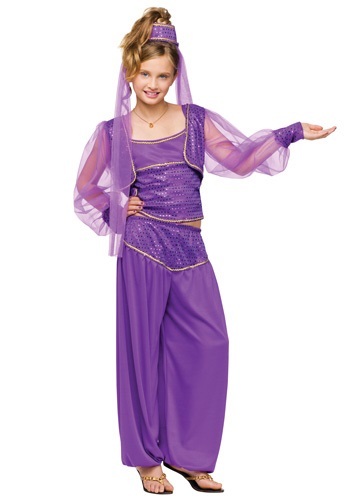 In any case, this costume--which has elastic in the waist and pant cuffs, a metallic gold-trimmed tank top, a sequined vest, and a headpiece with an attached veil--will prove an ideal fit for a girl who makes your dreams and wishes come true every day.